Most places I’ve lived I have been fortunate enough to have two fridge/freezers or at the least a large fridge and a chest freezer. This meant that I have always been used to having enough food to feed a small army at any given moment. It has also translated into a particular way of shopping for ingredients. Growing up in a farming household, I was always taught to “save the pennies and the pounds would come”. We used to buy things when they were cheap/in season and store them where we could. To this day I still live by the same mantra. If something is on special at the supermarket, I have been known to buy five of the same thing and store them until I need to use them (taking into consideration use by and expiry dates of course). So it should come as no surprise that as of last count I had no less than 11 boxes of frozen berries in the freezer section of our second fridge. This was never a problem until recently when the thermostat on the fridge section decided to give up the ghost. I’ve been able to empty the fridge and am slowly working my way through the freezer so that we can have it repaired. My main problem has been what to do with 11 boxes of berries. In summer we have shakes and smoothies, even berry ice-cream but in winter it is a little more challenging. I wanted to use them for something a little different, so I designed this recipe. I hope you like it. What is your favourite thing to do with frozen berries? Leave me a comment and let me know. Do the first step of the berry filling#. Preheat the oven to 180°C (170°C fan-forced). Line 22cm x 22cm cake tin with baking paper. Add butter to TM bowl and melt on 70°C for 3 minutes at speed 1. Add remaining ingredients and mix for 30 seconds on reverse, speed 3. Scrap around sides of bowl and repeat for another 30 seconds until well combined. Remove from bowl and press half the mixture into prepared tray and set the remainder aside. Bake base for 15 minutes, until slightly risen and lightly golden in colour. 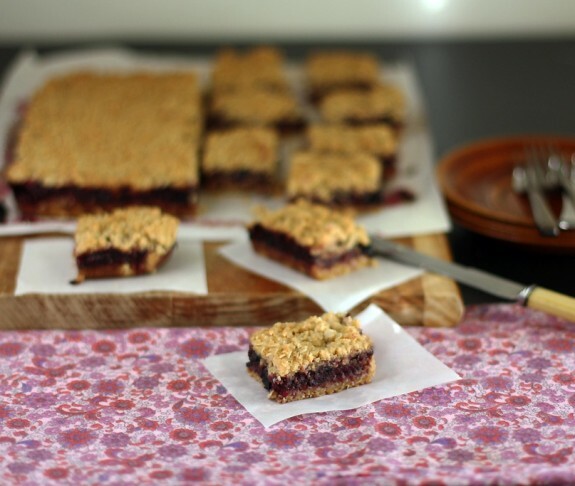 Once baked, remove from oven and cool for 10 minutes before pouring over berry mixture and sprinkling crumble topping. My tips/alterations: *Press the base down firmly before baking. It will seem like you don’t have enough but it rises a little. *When I halved the mixture, I used the scales to weigh it out. *This base/crumble mixture would make a great crumble topping for a pudding. I would pile it high for a great crunch. *You could top the base with anything you like, a custard topping or other fruit. #Place berries into sieve and set aside to defrost. Once defrosted, drain as much juice as possible. Add sugar to TM bowl and mill for 3 seconds on speed 9. Add lemon juice and well drained berries into TM bowl and cook at 100°C for 12 minutes on reverse, speed 1 with MC off. If mixture starts to splatter, place simmering basket on top of lid. Pour berry mixture over base and sprinkle remaining crumble over the top. Bake for an additional 30 – 35 minutes until crunchy and golden. Cool in tin for 10 minutes then remove from tray. Cut into squares and serve warm or cold. My tips/alterations: *This filling can also be used as a jam. Just pour it into a sterilised jar and allow to cool before storing in fridge. *Use any berries you like, adjust the sugar slightly depending on what berries you use. ease: 8/10. Not too difficult, just a few steps. prep time: 5 minutes for the crumble plus 5 minutes for the berry filling. cooking time: 45 minutes in total + cooling time. total: 55 minutes + cooling time. taste: 9/10. 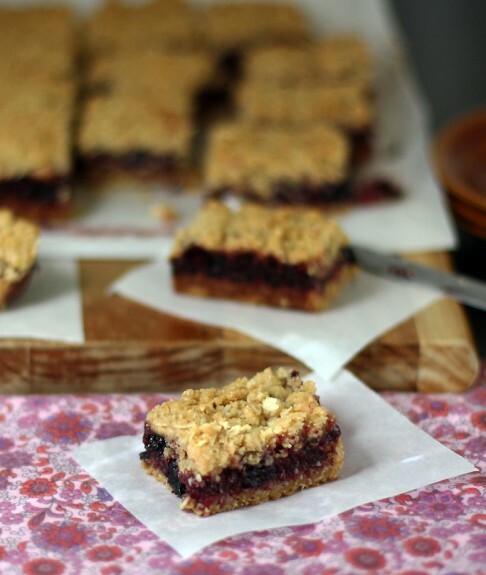 This is a yummy slice, especially if you are a berry lover. So easy for a great result. The sweet crumble and slightly sharp berries worked really well together. Everyone who was lucky enough to get a piece loved it.